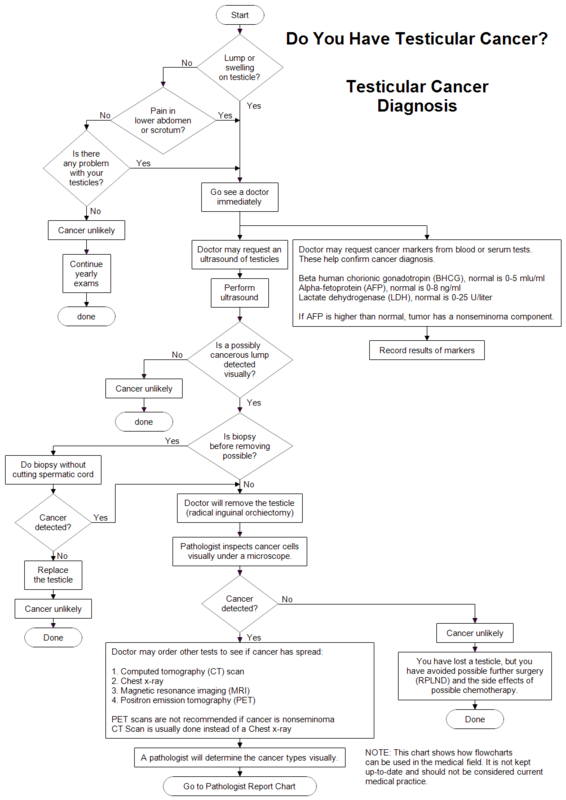 Description The flow chart above helps explain the steps taken in the diagnosis of testicular cancer. Each chart should have one clear starting point. There may be several exit points. The start and finish are shown using the terminal shape. The other two shapes used in the chart above are the decision shape for questions and the rectangle for statements. The lines with arrows show the direction of flow through the chart. Because of the serious nature of the subject, it is best to make the chart simple and clear, without much color. Once RFFlow is installed, you can open the above chart in RFFlow by clicking on testicular-cancer-diagnosis.flo. From there you can zoom in, edit, and print this sample chart. It is often easier to modify an existing chart than to draw it from scratch. To show that the chart continues on another page, draw a circle with a letter and reference that same letter on a following page.